Drew is the head coach of Hayden's basketball team this year. His friend Scott is the assistant coach. We have had two games so far and they are so exciting to watch. This is way more intense than soccer (thank goodness!). "Spread the floor!!!" Drew is a little more intense, but it's a great combination with the two of them! We went to look at Christmas lights at one of the neat churches in town. This is the first year we parked and walked around and got hot chocolate. The kids have always been too little so we usually just drive through. They loved running through all the lights and tunnel! hot chocolate...because it WAS COLD! When Hadley told Drew that her ballet class was going to have a Christmas program and she was going to be a "gingerbread man", he said, "don't you mean gingerbread woman?" So that's what she tells everyone she was now....that she's a gingerbread woman. They're performing this Saturday for a retirement home too! Hayden and Hadley are so blessed to have 3 great-grandma's. This is GG and grammy-great who drove in for Hayden's Christmas program from Wichita. We spent Thanksgiving in B-ville and had a great time! Uncle Kevin and Hadley and their homeade whipping cream! My stomach immediately dropped. There were probably 50 1st grade elves, all red and green except my son....who was wearing yellow. But he stole the show(I'm his mom, I can say that). I was SOOO proud of him. Not only did he know his lines, he was mouthing the lines of all the other elves. He also had a solo. Just a few lines from a song, but he did awesome! His dance moves were good too! We are so proud of him! And we were so blessed to have all the family drive from Wichita and the B-ville to watch Hayden and spend some time together! 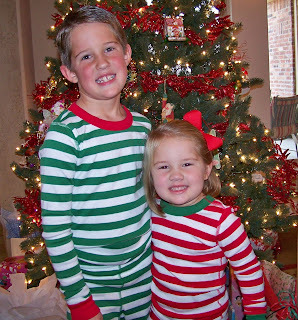 These are the pj's we got to wear on Christmas morning!